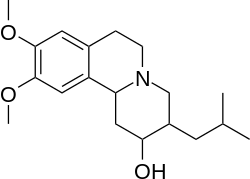 Dihydrotetrabenazine or DTBZ is an organic compound with the chemical formula C19H29NO3. It is a close analog of tetrabenazine. DTBZ and its derivatives, when labeled with positron emitting isotopes such as carbon-11 and fluorine-18, are used as PET radioligands for examining VMAT2. [11C]DTBZ as a PET radioligand with affinity for VMAT2 was developed in the mid 1990s by David E. Kuhl and colleagues at the University of Michigan. There are two enantiomers of alpha-dihydrotetrabenazine, and the dextrorotary(or (+) isomer) has a high affinity of about 1 nanomolar Ki whereas the levorotary (or (-) isomer) has approximately 1000 fold lower affinity with a Ki of about 2 micromolar. VMAT2 is a membrane bound protein and a biomarker for Parkinson's disease. Binding of DTBZ to VMAT2 in individuals with Parkinson's disease is significantly reduced. Moreover, the VMAT2 density as determined by [18F]DTBZ has been shown to be well, inversely correlated with the severity of Parkinson's disease. Avid Radiopharmaceuticals is sponsoring clinical trials of [18F]AV-133 (or [18F]Fluoropropyl-(+)-DTBZ) to identify subjects with dopaminergic degeneration. ↑ Koeppe, RA; Gilman, S; Joshi, A; Liu, S; Little, R; Junck, L; Heumann, M; Frey, KA; Albin, RL (June 2005). "11C-DTBZ and 18F-FDG PET measures in differentiating dementias.". Journal of nuclear medicine : official publication, Society of Nuclear Medicine. 46 (6): 936–44. PMID 15937303. ↑ Lin, KJ; Weng, YH; Hsieh, CJ; Lin, WY; Wey, SP; Kung, MP; Yen, TC; Lu, CS; Hsiao, IT (2013). "Brain imaging of vesicular monoamine transporter type 2 in healthy aging subjects by 18F-FP-(+)-DTBZ PET.". PLOS ONE. 8 (9): e75952. doi:10.1371/journal.pone.0075952. PMC 3786914 . PMID 24098749. ↑ Frey, KA; Koeppe, RA; Kilbourn, MR; Vander Borght, TM; Albin, RL; Gilman, S; Kuhl, DE (December 1996). "Presynaptic monoaminergic vesicles in Parkinson's disease and normal aging.". Annals of Neurology. 40 (6): 873–84. doi:10.1002/ana.410400609. PMID 9007092. ↑ Kilbourn, M; Lee, L; Vander Borght, T; Jewett, D; Frey, K (24 May 1995). "Binding of alpha-dihydrotetrabenazine to the vesicular monoamine transporter is stereospecific.". European Journal of Pharmacology. 278 (3): 249–52. doi:10.1016/0014-2999(95)00162-e. PMID 7589162. ↑ Wang, Jian; Hoekstra, Jake G.; Zuo, Chuantao; Cook, Travis J.; Zhang, Jing (February 2013). "Biomarkers of Parkinson's disease: current status and future perspectives". Drug Discovery Today. 18 (3-4): 155–162. doi:10.1016/j.drudis.2012.09.001. ↑ Hsiao, Ing-Tsung; Weng, Yi-Hsin; Hsieh, Chia-Ju; Lin, Wey-Yil; Wey, Shiaw-Pyng; Kung, Mei-Ping; Yen, Tzu-Chen; Lu, Chin-Song; Lin, Kun-Ju (1 June 2014). "Correlation of Parkinson Disease Severity and F-DTBZ Positron Emission Tomography". JAMA Neurology. 71 (6): 758. doi:10.1001/jamaneurol.2014.290. 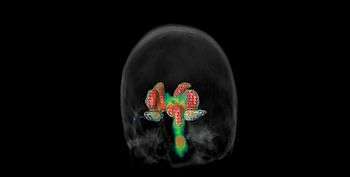 ↑ "A Trial of 18F-AV-133 Positron Emission Tomography (PET) Imaging to Differentiate Subjects With Parkinson's Disease (PD) From Other Movement Disorders". Clinical Trials. U.S. National Institutes of Health. Retrieved 20 July 2015.